Today we are featuring two mini reviews from fellow fans of the slasher genre as they each talk about their slasher favorites. Thank you Kevin and Sean for sharing your slasher favs! Go to the Slasher Studios Facebook Page and select a picture from your favorite slasher movie and do a small write up and we will feature you and your review on our site. One special review will win a free autographed copy of Teddy! I don’t know how to start this, to be honest. I truly adore the salsher-genre of horror films, so it’s actuall hard for me to pick just one film. 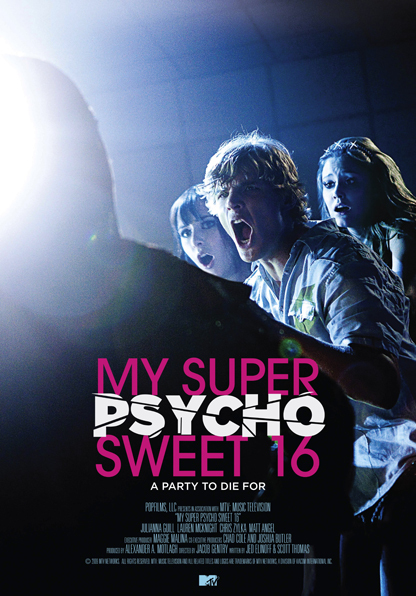 In all honesty, my favorite slasher changes with the seasons, but, my heart will ALWAYS have room for the made-for-tv film My Super Psycho Sweet 16. I remember seeing a TV spot for it on MTV back in the begining of October 2009, about a month before it’s release. I had low expectations for the film because of the act that it was attatched to MTV, but, when I saw it, I fell in love. My Super Psycho Sweet 16 stays true to the 80’s slashers with it’s cliche characters, catchy, quotable dialouge, and fun deaths, which makes the film really enjoyable. The acting was actually really good, too, considering most of the actors weren’t really ‘experienced,’ if you will. Especially the minor characters, they definitely deserve to be in more films, and I’m sure they will be. As for the special effects, they’re probably the best you’ll see in a made-for-tv film, and they’re not even that bad. While using a perfect amount of CGI, the kills were put together really good. All-in-all, this film was truly an amazing film, with every cliche a horror film can have, this film is probably one of the best slashers this generation will get. Spawning 2 sequels, this film seems to have a cult following in the future.